The snippet that’s added reveals the claim and who made it, along with the name of the organisation that checked it and what they concluded. Even though differing conclusions may be presented, we think it’s still helpful for people to understand the degree of consensus around a particular claim and have clear information on which sources agree. 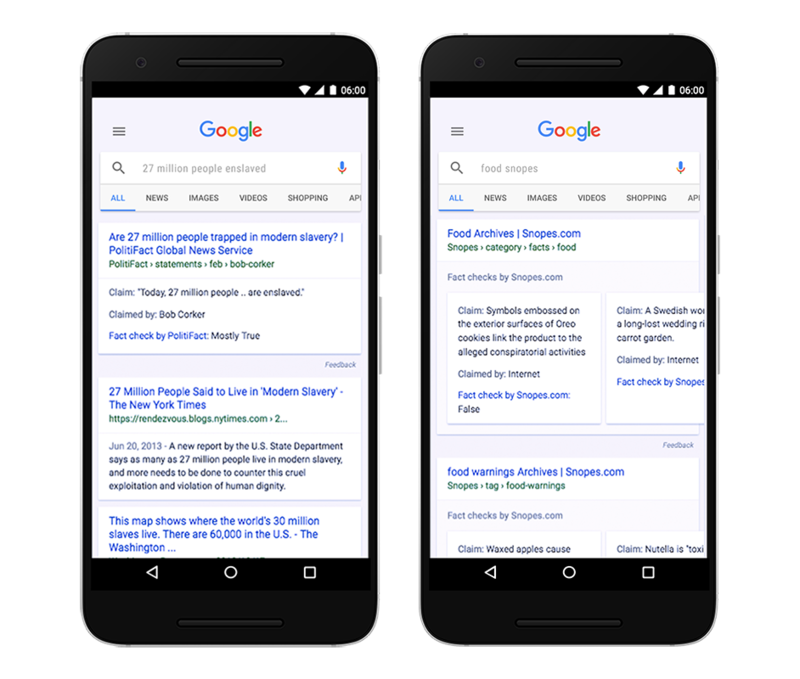 Conversely, not every news article or search result will include the extra information. Not every article will be checked and Google won’t publish every check completed. The content, publisher and fact check claim must meet the search giant’s standards and adhere to its policies for the fact-check label to appear. It doesn’t do anything to affect the ranking of the articles. If the fact check article would normally show up on page four, it will still show up on page four. Testing for signals that an article has misled people, so it can improve News Feed ranking algorithms and reduce the prevalence of false news content. Testing ways to make it easier for readers to report a false news story, with stories flagged as false by users showing up lower in the News Feed. Working independent third-party fact-checking organisations to flag potential fake news and reduce their ranking in the News Feed. It’s early days and we may see some of the other tech companies offer tools to help users spot and flag up fake news. For now, we’ll just have to wait and see whether these two efforts hold back the spread of fake news, or simply provide the reader with some additional information to help them make a more informed decision. With the onus, it seems, likely to stay with each and every one of us for the time being, we recently shared some advice on how you can help in Fake news: what can we all do to play our part in combating it? Snopes is not above reproach. Google, Facebook and Twitter considers anything from or about conservatives Fake News. They are blocking free speech for this side of society. If you use Snopes (or any place really) for fact checking, read it with a grain of salt. They are not “always” accurate. Judging whether news is fake or not is not by “technology”; it’s by intelligence of human beings.